I respond to private memories and childhood experiences. Without falling back on representational imagery, my drawings veil these experiences in an abstract vocabulary of line and space – simultaneously exposing and protecting the memories. My deliberate use of only black and white is meant to convey the essence of things. I revel in the endless variety, richness, and liberty of using this limited palette. I work in charcoal and chalk pastel, a spare and expressive medium by which I convey my visual metaphors. The resulting drawings are elemental and bare-boned. With my personal use of materials and my distinct vocabulary of marks, I engage in a subtle and evocative dialogue. Working on each drawing, I explore the unique marks of my hand, like a calligraphic language. My visual sources are tied to forms rooted in decayed nature, weathered surfaces and rusted metal. My work recognizes imperfections and flaws created by nature or man’s interference with nature, implying a passing of time. The attention I give to edges, surfaces, and forms expresses the otherwise intangible and alludes to metaphors that interest me. 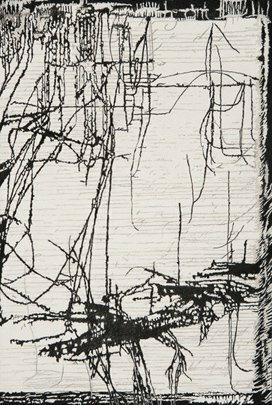 My drawings begin with a general idea including a scaffold of compositional elements and, working intuitively, the work evolves from there. Each drawing transcribes an ongoing, three-way conversation between the materials, the unique marks my hand makes and my emerging vision. As I work, new dimensions of meaning emerge. I am on a journey of discovery to detect the secrets that are embedded in the process. During periods of reflection, the image and I inform each other to reach a unique visual resolution.